Source: CICH graphic created using data adapted from the Canadian Wildfire Information System of Natural Resources Canada. http://cwfis.cfs.nrcan.gc.ca/report/graphs#gr1 – accessed March 8th, 2017. 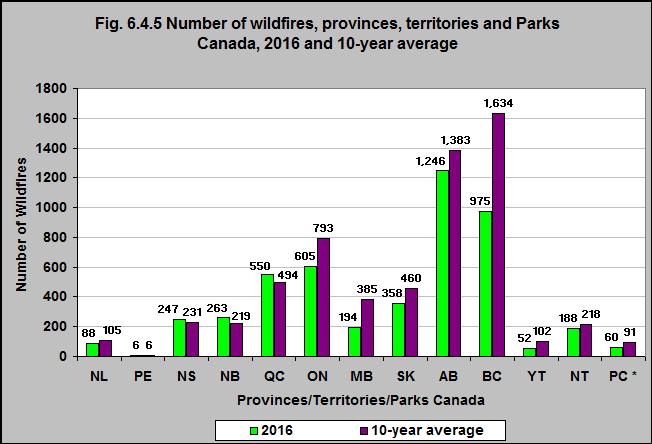 In 2016 there were 975 wildfires in British Columbia – the 10-year average for that provinces was 1,634. In 2016 there were 1,246 wildfires in Alberta and the 10-year average was 1,383. 3Robinson, B., & Alatas, M.F., Robertson, A., & Steer, H. (2011). Natural Disasters and the lung. Respirology, 16 (3). 386-395, as cited in Berry et al., (2011), above.